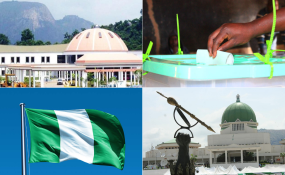 What are the issues that will shape the general elections of 2019 in Nigeria and how do the electorates make informed choices, especially for the ultimate office? This question is the key to unlocking the focus of this article. How do we separate genuine contenders from pretenders and even further, the impostors? Let me start by acknowledging that our democracy is still devoid of any discernible ideology, principles or lofty ideas. It is simply a mad grab for power at its rawest form, hence the 'winner takes-all', 'me-or-no-other' mentality associated with it. There is a rash of the 'not-too-young-to-run' crowd, they're all over the place, stumping the ground and shaking the tables vigorously, telling anyone who cares to listen, that they want to be president. There are also a handful of professionals and intellectuals in politics; who believe it is their season to be president. While these two groups are essentially naïve and starry-eyed about power and politics, however, the veteran traditional power brokers are cold, brutal and calculating. They are the undisputed lion-kings in the African savannah; dangerous but calm, unobtrusive and unruffled but deadly. They made the rules of the political game, enforce these rules, determine players in the game, and expect everyone to play by their playbook. Those who refuse to play accordingly are summarily shoved off the power loop. There are, seriously speaking, perhaps less than five parties in contention. If truth be told, however, it's actually a two-horse race. Maybe two or three more will record a handful of votes in one or two states. The rest are impostors, and these, to my mind are mere attention seekers. In actual fact, the fight is a straight one between incumbent Muhammadu Buhari (APC) and Atiku Abubakar (PDP). These are the contenders. Among the many pretenders are Donald Duke (SDP), Kingsley Moghalu (YPP), Obadiah Mailafia (ADC) and others. Even if all the other 80-plus or so parties coalesce and become one party, they still will not offer any serious challenge to these two. The likes of Donald Duke, 'fine boy' alright, but this is not a Mr. Nigeria contest. A political party needs to have three things essentially, among others, to win elections; structure, finance and name recognition. What is structure? In political terms, I will use the example of the recently concluded Osun state governorship elections as example. There were 3,600 polling units where voting took place across the 30 local government areas in the state. Each party was expected to have its agent at each of these polling units. That should have been, 3,600 agents, or persons multiply these across 36 states and the FCT. Imagine the logistics needed for these people. Take the money factor, a serious presidential bid should cost, at least, N20billion, and I am being conservative in my estimates. With the foregoing, I'm constrained to inquire if the driving motive of the impostors and pretenders is to serve, why not begin as a local government chairman or house of assembly member? But obviously, these positions are beneath the self-inflated egos of these individuals. Nigeria's political system is gamed. Current President Muhammadu Buhari signed off the not-too-young-to-run bill very quickly and without fuss. Why? He knew he was only handing the 'children toy cars'. It is a worthless piece of legislation. I see a complete lack of intellectual understanding of this environment or it is just mischief really? To refer to those societies as examples of what is possible in Nigeria is the height of intellectual naiveté at best and utter foolishness or insanity to be candid. The Patriarchal Nature of Nigeria's Democratic/Leadership System. Men rule the political turf here. And these are not just ordinary men. I mean very strong men and the emphasis is on the word 'strong'. They were former kings who rather than die or retire quietly like Pope Benedict, have become kingmakers. Theirs is a super elite club. They are not younger than 60 years. They have power, money and contacts. And they're not shy wielding the big stick. They are the landlords of this nation. They are in charge. Without them, you cannot become anything in the political space except by divine intervention. The likes of Akin Ambode, Ibikunle Amosun, Shehu Sanni, Gbenga Ashafa, Suleiman Abba, et al, are learning that 'man pass man' in this environment! You can be a governor, senator, IG, or professor, and still be rough-handled. Even a sitting president, with all his power and money was removed with a combination of political wrestling, jujitsu and karate. He's retired and writing books now. Ability to Win the Critical Base of Power Brokers (the Kingmakers). You must be able to win the support of this group. Except you are a Peter Obi. The Socio-cultural and Religious Realities of our Society. In this society, ethnicity, religion and culture plays a major role in election outcomes. The north-south divide is very real in election contests, likewise the issues of gender, and tribe. For the female aspirants like Oby Ezekwesili, they are just wasting their time and resources. She's worse than an impostor. Why? The entire northern region, in this 8th NASS has only one female senator and there has never been a female deputy governor, let alone governor Infact, there has never been an elected female governor in Nigeria. Under extraneous circumstances, Dame Virginia Ngozi Etiaba, was the Governor of Anambra State, from November 2006 to February 2007. Whether there are five or 91 political parties, the political history of Nigeria has shown that essentially, the country votes in a two-horse race to choose presidents. That is the history from independence till date. It will not change in 2019. It is still a pyramid system of decision making. The electorates vote for the candidate the 'strong men' tell them to support. The voting power blocks shows that in the 774 LGAs, and over one million wards, there are individuals who ensure the masses vote certain candidates of political parties as dictated to by the power brokers. They're the chief responsibility officers (CROs) assigned to deliver their catchment areas for the candidates/parties. Our politics as stated earlier, is totally devoid of ideas or principles. There are no clear and distinct ideologies among parties. This means that it is still essentially driven by basic issues such as godfathers, money, coercion, bribery and instant rewards. Those speaking their English and mobilizing voters via Facebook and Twitter can continue wasting their time. On the day of voting, it's about who the 'gods' have chosen and how much money can be shared to electorates.